Benchmark is a new tool introduced by minerstat just recently and it is already amongst the most used tools on the dashboard. Benchmark is something that needs to be both, simple and complex. Simple, because it is often used for finding rough speeds on algorithms with different mining clients. Complex, because you also want to tweak, compare, set your own parameters, your own overclock settings, and have control over what to measure in your benchmark reports. At the same time, a benchmark is a tool that benefits both, those with a small number of rigs and those with large farms. We have considered all that and more when we have started building our benchmarking system. Simply said, a benchmark is a set of objects that are compared to each other and then evaluated by some measurement. In mining, the objects are different configurations or different algorithms and they are compared by the speed. Because different algorithms also have different power consumption which can later affect the final profitability of the machine, this can be an important unit to measure as well. While benchmark can be used as a simple tool that tells you which algorithm or mining client is the best for you, it can also be a tool that helps you fill up those algorithm settings and values under your profit switch. Who can use minerstat’s benchmark? We have excluded ASICs from the benchmark for two reasons. The speeds are usually known and provided by the manufacturer. At the same time, ASICs are mining coins within the same algorithm, so the speeds and power consumptions in the comparison are the same and only the price and pools’ fees are the factors that determine which option is the most profitable. How does minerstat’s benchmark work? In this tutorial, we will show how to set up the benchmark for two types of usage. A simple benchmark that will get you some initial speeds. The advanced benchmark where you will be able to control every parameter that influences the speed. But basically, both of these two types are used in the same way. Select the worker you want to benchmark. Select the benchmark duration (fast, medium, slow). Add algorithms, clients, and configs that you want to benchmark. Save for later or save and benchmark right away. When the benchmark command is sent to the rig, you will need to wait for it to finish. After it finishes, your rig will continue to mine under the configs that are set in worker’s config and you will be able to check the results of the benchmark under your benchmark menu. Your rig needs to be running when the benchmark command is sent (so don’t forget to click Start mining if you are using Windows node or have the rig turned if you are using msOS). If you missed it, you can always wait a few minutes and resend the command to benchmark by clicking Continue with benchmark. You can create an unlimited amount of benchmarks. Also, note that you can run multiple benchmarks at once as long as they are not applied to the same worker. So in case you want to save time and have multiple similar rigs, you can just divide the benchmarks between them and run it at the same time. A simple benchmark is perfect when you want to learn what are the speeds the mining clients can reach under the default settings and find which are the algorithms you can mine in the first place. The goal of this benchmark is to get some initial results without having to find pools or creating new wallets. So for the benchmark to work, you only need a worker that is connected to minerstat. Navigate to benchmark page and add new benchmark. First, select your worker from the drop-down menu. Name your benchmark, for example, 1080-simple. For testing purposes, you can leave the benchmark duration at fast, but note that some mining clients need more time to get the results than the others. If you have time, slow might be the better choice. Under benchmark options, you can add algorithms you want to benchmark, select clients, and configs for them. You can see that there is a long list of available algorithms. You can include all of them to the benchmark or select just a few of them. Each algorithm has one or more mining clients available. Select the ones you like - or select one algorithm multiple times with different mining clients to test them out. The last but not least is config. In this simple benchmark, we will leave the config at minerstat default. It means that you will be able to benchmark the selected algorithm with default configs on our sandbox pool (pool.ms). 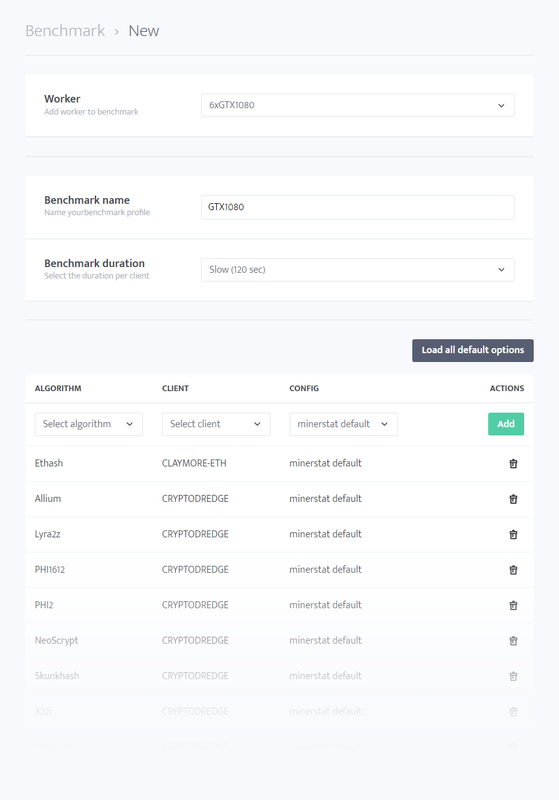 If you want to benchmark all possibilities, just click the button Load all default options and you will be able to benchmark all algorithms and mining clients that are available for your worker. After you have defined all of your options, Save or Save and benchmark. The advanced benchmark is perfect for when you have a clear vision, which algorithms, pools, and clients you want to test out. You might also have your favorite overclocking settings ready and need information on speed and power consumption that takes into account that as well. Hence, it will take more time to set up the advanced benchmark. But, if you take advantage of all of the minerstat features, it can still be very organized and get you just the results you need. Before you start, we suggest you think about which algorithms will you test out, so you can prepare all the things you need. Your first step is the address editor, where you can set up all of your pools and wallets on which you will benchmark. Make sure to select the pool you know it is working. Hint: A good approach to make the most out of benchmark, is to select the multi-algo pool that offers you an option to get paid in one currency. If you will test out multiple algorithms multiple times, you won’t have to define multiple wallets, but only one. And, if you don’t want to define multiple pools, you can still define only minerstat’s sandbox pool. If you want to test overclocking, you also need to define overclocking profiles in ClockTune. The next step that will prepare what you need for your advanced benchmark is config templates. Config templates allow you to connect ClockTune profiles and your custom configs. This feature also allows you to have multiple configs defined for the same mining client. After the first three steps, you have everything ready to start creating your advanced benchmark. Navigate to benchmark page and add new benchmark. Select your worker from the drop-down menu. From the algorithm’s drop-down make sure to select the algorithms that you have prepared your configs for. Each algorithm has one or more mining clients available. Select the ones that you defined in your config templates. Under the config’s drop-down, you will be able to select the config templates that you have previously prepared. You may have asked yourself, how is possible to mine with default config without setting the pools and wallets? Benchmarking with minerstat default config will make your workers mine to the minerstat’s free sandbox pool.ms, which assures that the benchmark will run without interruptions, such as wrong ports, connectivity issues, or downtimes. It is not a real pool, which means that the shares provided from the benchmark won’t earn anyone any money. The sole purpose of this pool is to get information about the worker’s speed and power consumption. But, this is only the case for the default configs. If you select a config from the config templates as it is explained in the advanced benchmark section, all earnings made from benchmark will go straight to your wallet. The minerstat testing pool is available under default config option, but can also be used by everyone that wants or needs testing stratum. Just mine to it with any client and the client will act as you are normally mining and show you the speeds and other information that is provided. But once again: this is only a testing stratum, so no earnings can be made from it as it mines “empty”. Paused: Benchmark can still be edited. Pending: Benchmarking is waiting to be executed. Completed: Benchmark was successfully completed. You can click on each benchmark and check its details. You will be able to see a list of all algorithms and mining clients that were benchmarked, their speeds, and power consumption if it was provided by the mining client. Results can be also opened on a public benchmark profile, exported as JSON, imported to profit switch, or exported to our mining calculator with real-time results. Stayed tuned as there is a lot more coming to the benchmark tool. Benchmark is free for everyone. Benchmark is fair as it can be conducted to your own wallets and pools (advanced benchmarking) or to universal testing stratum pool that mines “empty” and nobody earns from it (simple benchmarking). Benchmark can be exported and saved directly to mining calculator. Hashrates and electricity consumptions can be loaded to profit switch. Benchmark results are available on a public profile.